Dedicated to improving website accessibility and usability ! What will it cost me to join the Usability Exchange? Who can use the Usability Exchange? Do I need to do anything before registering with the Usability Exchange? Do I need a credit or debit card, or a bank account to set up a PayPal account? What restrictions are there on setting up a PayPal account? I am having problems registering with PayPal. I am having difficulty viewing or using the Usability Exchange website. How do I change my email address, username, password or other personal details? I have forgotten my username or password. What should I do? Can I register as both as an organisation and a tester? How do I view the payments I have made or received? I have read these frequently asked questions but am still having problems. How do I start testing content and getting paid? Do I have to complete all tasks successfully to get paid? Are the payments I receive from the Usability Exchange taxed in any way? How do I start testing content with end users? I have created a test using the test wizard. How do I select different users for the test? I have created a test using the test wizard. How do I select different tasks for the test? How do I send messages to testers? When must I pay for a test? It costs nothing to join the Usability Exchange as an organisation or as a tester. Organisations only pay to submit tests and end users actually receive payment for completing tests. Registration with PayPal – used to send or receive payments – is also free. Organisations or testers must reside in the UK to use the Usability Exchange – we are currently working on providing international support. We strongly encourage you to register with PayPal before registering with the Usability Exchange. We use PayPal to send and receive most payments and you will typically need a PayPal account to make or receive a payment. Registration with PayPal is free. You do not need a credit or debit card, or a bank account to register with PayPal. If you do have a bank account, you will be able to transfer money directly from your PayPal account into your bank account. If you do not have a bank account, there may be a limit on the amount of money that you can send or receive using your PayPal account. Registration with PayPal is free. You must be over 18 to register with PayPal. If you experience any problems registering with the PayPal website, contact us by phone or email. We will attempt to resolve any problems you have or can register you with PayPal on your behalf. You can change the text size and page colours for this website by going to our accessibility page. We also provide a range of access keys so that you can browse this website using your computer keyboard. Details of these access keys can also be found on our accessibility page. To save you time, your particular accessibility preferences will automatically be loaded whenever you log in to your account. If you are still experiencing problems using our website, please contact us directly and we will try and resolve any accessibility or usability issues you might be experiencing. Log in to your account and click on “Settings”. To receive a username reminder or a new temporary password, go to the “Log in” page and click “Get login reminder”. Yes, you can set up two separate accounts, one as an organisation and one as a tester. You cannot, however, use a single account to set up tests (as an organisation) and to run tests (as a tester). Once logged in, a list of your payments made/received can be viewed by clicking “Payments”. If a payment is marked as “Paid” then we have already credited or debited you with the amount shown. If the payment is marked as “Outstanding”, the payment is due to be credited/debited to you at the end of the current month. Your account summary indicates the total value of outstanding payments that are due to you. Note: there may be additional transaction charges deducted from payments to/from you by PayPal. You should consult PayPal directly for a breakdown of these charges, which will be clearly indicated in your PayPal account statements. If you have a specific technical problem with the Usability Exchange or need help, contact our support desk. 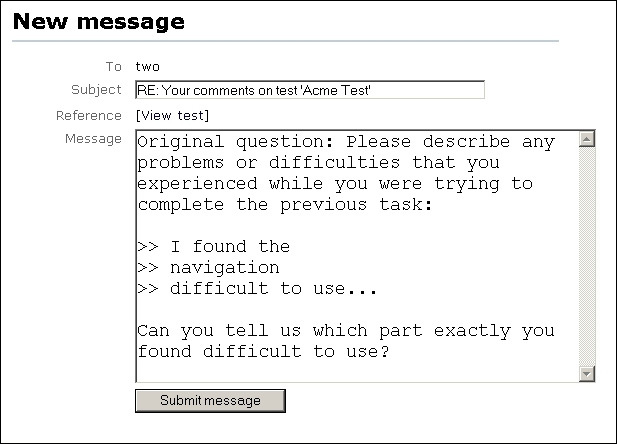 If you have a general query about the Usability Exchange, send us a message via our feedback form. Firstly, it is advisable to register with PayPal if you have not already done so. Then set up a new tester account with the Usability Exchange. Wait for email notification that a new test has been sent to you and then log in to the Usability Exchange to view “All tests”. Any new tests that have been submitted to you will appear in your lists of tests. Click on any test to see how much you can earn and then click “Start testing” to begin the testing process. Once you have finished testing, your account will be credited with the appropriate amount for that test. No. As long as you attempt all tasks in a test and answer all questions, you will be paid for completing the test – payment is not conditional on users completing tasks successfully. Testers should attempt all tasks to the best of their ability, with the aim of completing all tasks successfully. Some websites, however, may be difficult or cumbersome to use and it may not be possible to complete certain tasks in the time allowed. From the access logs recorded during testing, it will be clear to the Usability Exchange which testers have spent the most time and effort trying to complete tasks. These testers are therefore likely to receive a higher rating and more testing work. By contrast, testers who put little effort into completing tasks may receive a poor rating and less testing work. In general payments are made directly to each tester’s PayPal account – it is therefore advisable to set up a PayPal account before registering with the Usability Exchange. You can withdraw money from your PayPal account into your own bank account or pay for items using PayPal directly. For testers on income support or receiving other state benefits, we can also make payments using luncheon vouchers. All testers should read our “Important information regarding payments” before they start using the Usability Exchange. You will be paid towards the end of every month. We aggregate all payments at the end of every month, rather than make payments instantly, to reduce the commission charged by PayPal or other payment providers. No. VAT is not included in the payment we make to you and we do not deduct any money from your payments for National Insurance or Income Tax. If you are an individual, you should treat all payments you receive from the Usability Exchange as additional income with regard to your income tax – this income may need to be declared to HM Revenue & Customs or other government departments. If you are VAT registered company, you should treat all payments you receive from us as having no VAT. All testers should read our “Important information regarding payments” for further information about the need to notify UK government departments of income received from the Usability Exchange. Firstly, set up your account with the Usability Exchange. Once logged in to the Usability Exchange, click on “Create test” and select the type of test that you want to create. Once you have set up and paid for your test, it will be submitted to end users. Select the test from the list of “All tests”. To remove a tester – Click on “View or modify selected testers” and then deselect one or more testers using the checkboxes provided. Click “Update testers” to confirm your new selection. To add a specific user – Click on “View or modify selected testers”, enter the user’s username into the “Add user” section of the page and click “Add user”. To create a new user group – Go to the “Create new user group” section in the test and select the properties of your target users and the user group size or maximum budget. Finally click “Create user group”. A random group of users will be generated for you. Note: when you create a new user group, any existing testers will be deleted from your test. Click on “Return to test” to modify other properties of the test or click on “Submit test” to submit the test as it stands. It is not possible to change the users for a starter or intermediate test. To add a new task – Select the type of task from the “Add task” popup towards the top of the test and then click “Add task”. To modify an existing task – Click on the task in the list of tasks towards the top of the test. To delete an existing task – Click on the “Delete” button next to the task in the list of tasks towards the top of the test. It is not possible to change the tasks on a starter or intermediate test. You can reply to any feedback received from users by clicking on “Reply” on any “Task responses” page. After you submit your response, the user will receive your reply and can respond accordingly. You can also respond to messages in your inbox by selecting the message from “Inbox” and clicking on “Reply to this message”. You must pay for tests at the time you submit them to end users. You can pay for them using your Usability Exchange account, by credit or debit card or by using your available PayPal balance. You are free to create multiple tests in draft form, ie. without submitting them to end users, for no charge. "PAS 78 reminds website designers to consult disabled people and involve them in testing their designs at every stage of the site development cycle. Research published by the Disability Rights Commission in 2004 showed that testing with disabled users may uncover 45% more accessibility problems than testing with software alone." "We're delighted to have had the opportunity to work with the Usability Exchange to help shape the development of its new web-based service. Our goal is make our products and services as easy to use for all our customers as possible, and the hands-on usability testing of our sites by disabled users that the Usability Exchange product offers will be invaluable in helping achieve this." "We are keen to ensure our products are accessible by all users. The Usability Exchange offers a simple and effective way for us to test our products with users who are disabled." "The Usability Exchange provides a fast and effective way for us to hear what disabled users think of our websites - we get real users' feedback directly and can work with these users to identify and resolve any accessibility or usability issues that might arise." "As a blind internet user I regularly come across websites that claim to be accessible but are virtually impossible to use. By involving disabled people in the testing process, the Usability Exchange could help organisations create websites that are much more accessible and usable by disabled people." Disability: Is technology changing the game?